One of the difficulties with being a home cook is that it takes time, and on weeknights especially, time is at a premium. I often don’t get home until 7:30 or later; some nights the prospect of then chopping food, cooking and dishing up can be daunting enough to make me want to run out for empanadas instead. But that adds up. So when I had a few days off for the holidays, I decided to cook a few things to put in the freezer so Scott or I could reheat them for fairly quick dinners. I started by making mac and cheese — more accurately, penne and cheese, since you can use pretty much any tubular pasta for good results. 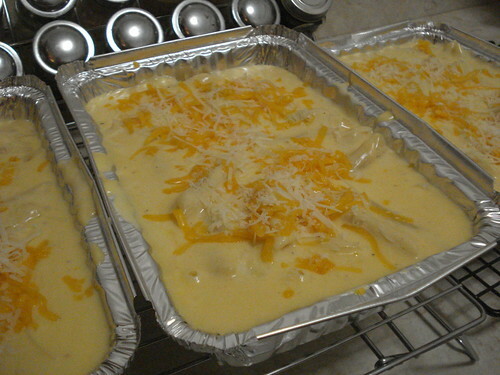 The recipe I use comes from Martha Stewart’s Comfort Food, and it certainly is that. It’s not as simple as mixing powder from a box, but it’s so much better than the packaged stuff that it’s worth the effort. Anyway, it’s not that hard, though maybe I just have enough practice to have gotten good at it. 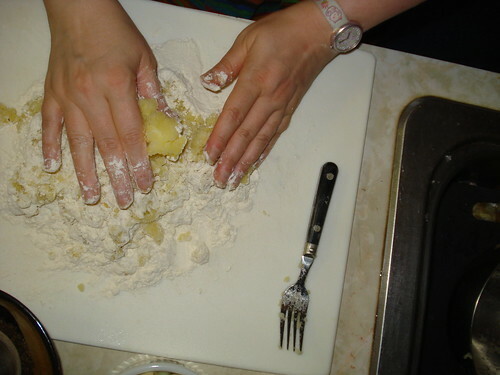 I cooked a pound of dry pasta until it was not quite done — the noodles cook a bit more in the sauce while baking. I divided the cooked pasta into a few foil containers that I could put directly into the freezer later. 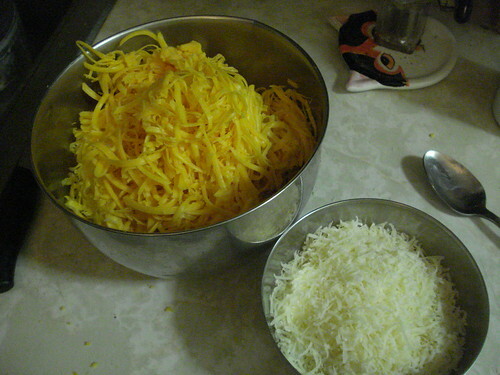 While the pasta cooked, I grated cheese: about 4 1/2 cups of cheddar and 1 1/4 cups of Parmesan (Martha’s recipe calls for Gruyere or Romano but Parmesan works as well). 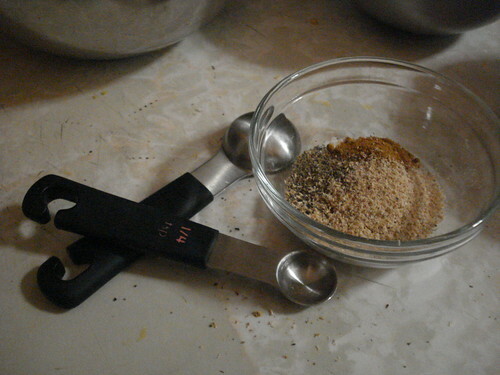 I also measured out 2 teaspoons of salt and 1/4 teaspoon of cayenne, then grated what looked like 1/4 teaspoon of black pepper and 1/4 teaspoon of nutmeg. I heated 5 1/2 cups of milk until it was not quite bubbling. 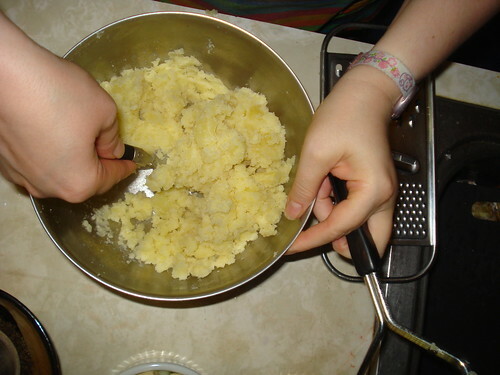 In a large pan I melted 6 tablespoons of butter, then added half a cup of flour and whisked it together for 1 minute to form a roux. 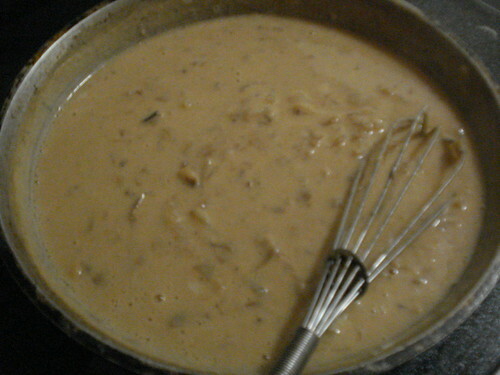 I poured in the warm milk and whisked and cooked the mixture until it was bubbling and had thickened a fair bit, then removed the pan from the heat and added the spices and most of the two cheeses, whisking until the cheese was melted and the mixture smooth. 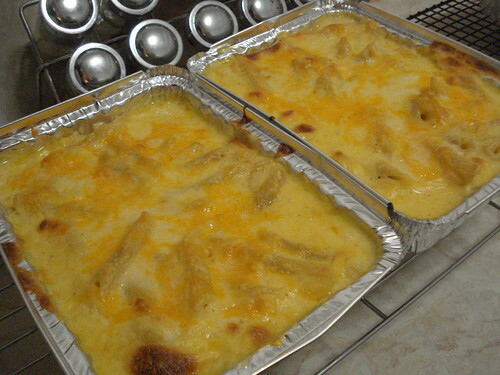 I poured it into the pans with the pasta and sprinkled the remaining cheese on top, and put them into a 375-degree oven for half an hour. You’re supposed to let the cooked pasta cool 5 minutes before serving. I let ours cool a bit longer, because once I’d gotten the pasta into the oven I started working on the chicken green curry and it took more time than I’d intended. I chopped up chicken breast, onions, zucchini, red potatoes and mushrooms; I lightly cooked the chicken pieces in some olive oil, then added the onions and mushrooms. 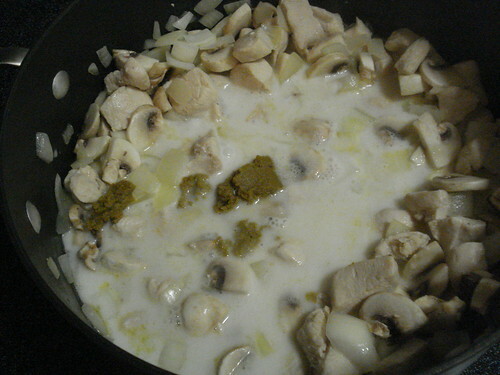 Then I added a can of light coconut milk and stirred in a couple of tablespoons of green curry paste (from a jar, not my own, though that will be on my list to do). You’re also supposed to add some fish sauce, but I didn’t have any and couldn’t find any at my regular supermarket, so I improvised a substitution: soy sauce plus a little Worcestershire sauce and some salt. Not perfect, but close enough for my purposes. I added the rest of the vegetables and another can of coconut milk, though in hindsight I think I should have stuck with one can and just added a small amount of broth or water. The final curry was good but more liquidy than I intended. I brought the mixture to a simmer and let it cook for about half an hour. 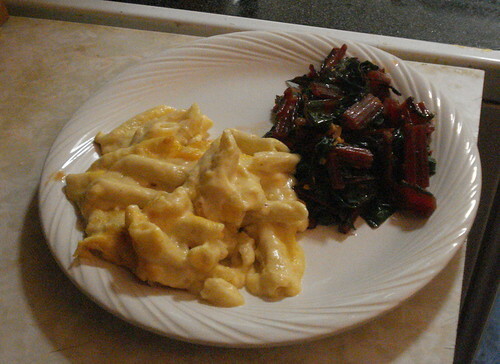 We had one of the containers of penne and cheese for dinner, with some braised red chard. 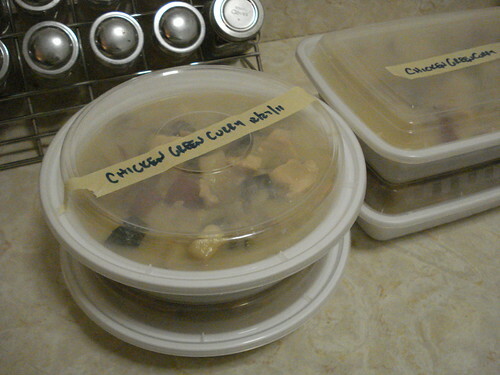 I froze the rest of the food when it was cool: six meals into the freezer. Not too bad for one long evening’s work. One of my goals with the blog as I finish up the cookbooks in my collection is to start catching up with the cooking magazines that I’ve been neglecting for nearly two years now. (Yikes, really? Really.) On Sunday I was getting ready to go out for brunch and run a few other errands, and realized that I wanted to try a new recipe for dinner but hadn’t picked anything out. I didn’t want to load a heavy cookbook into my bag, so I grabbed the most recent issue of Cooking Light and headed out the door. Later, after a terrific brunch of eggs Benedict and mimosas, I began leafing through the magazine. One of the things I like about Cooking Light is that the recipes don’t usually rely too much on things like low-fat cheese to keep the fat and calories down. This is good for me because I don’t think you can find low-fat cheese in my neighborhood. I despair of trying to explain the concept to our deli man. He would just laugh at me and tell me to eat more feta and olives. And you know what? He’d be right. But anyway, the recipes in the magazine use a number of tricks to keep foods light: baking instead of frying, using 1% milk instead of whole milk, using a smaller amount of a more flavorful cheese. 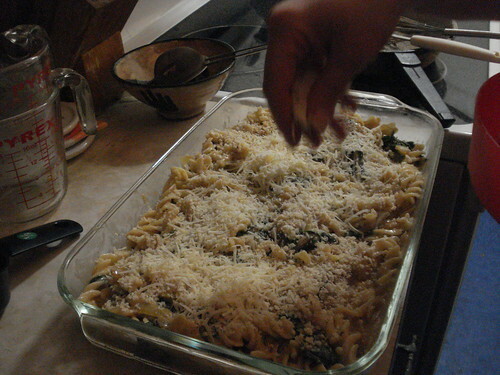 For this recipe for baked pasta with spinach, lemon and cheese, one of the tricks is building flavor by browning onions as the base of the pasta sauce. It sounded like it would be hearty but not heavy, and I thought that might be nice for a gray, rainy evening. 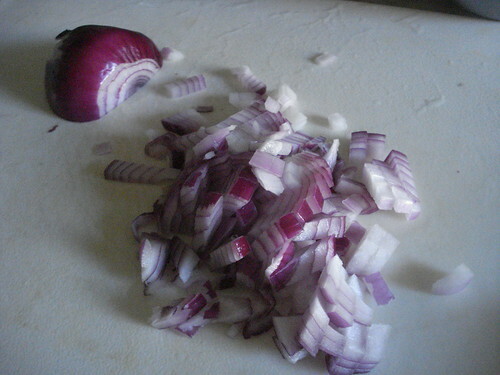 I started by prepping my ingredients. Well, I didn’t have to prep the spinach: I bought a package of 5 ounces of baby spinach, exactly the amount called for, so I didn’t have to measure that. 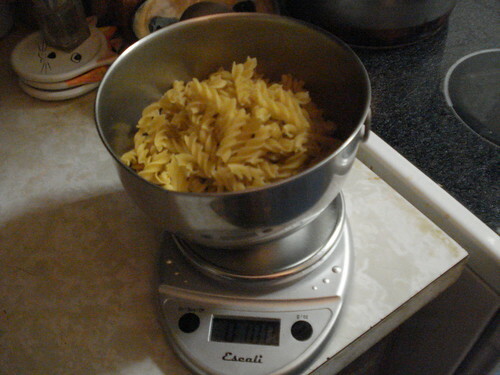 I did have to measure the pasta, though, since the recipe calls for 10 ounces and I only had 16-ounce packages. But I have a scale, so I didn’t have to guess. 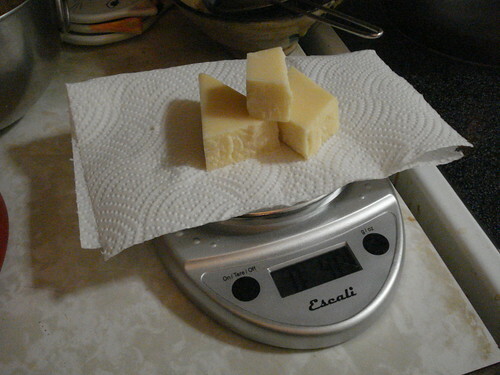 I also used the scale for the parmesan (4 ounces from an 8-ounce wedge — and if I had just eyeballed it I would have gotten it wrong) and for the flour. 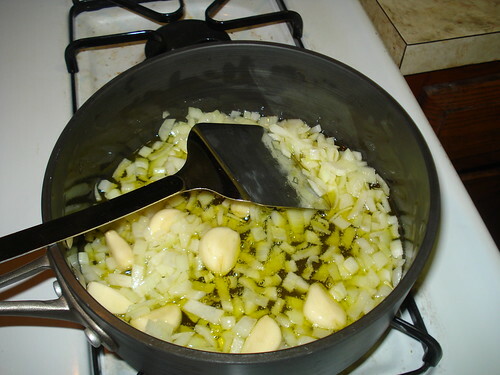 I chopped onions, 4 cups’ worth, poured out the right amounts of milk and white wine for the sauce, and zested a lemon just enough to get 1/4 teaspoon of zest. While I prepped, rain lashed against the windows. I was particularly glad we weren’t going out, or expecting a delivery person to come out in the downpour. 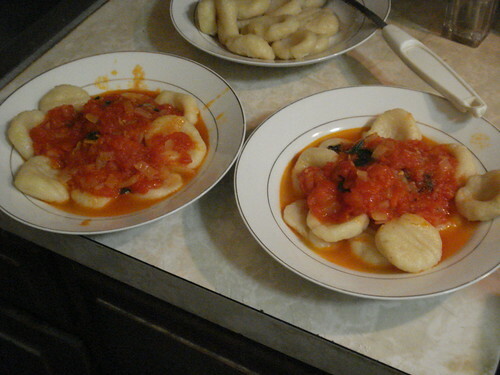 Then I started cooking. I boiled the pasta for about 8 minutes until it was almost al dente, then pulled the pan off the heat, stirred in the baby spinach and let it sit for 2 minutes, until the spinach wilted. 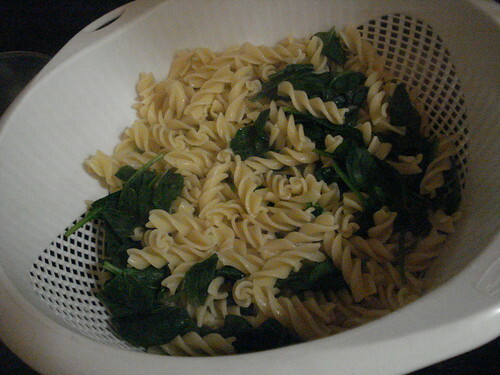 Then I drained the pasta and spinach. 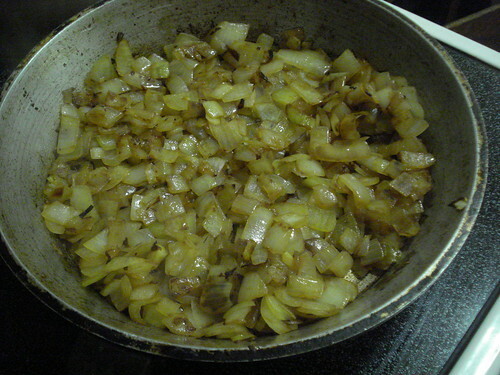 In the meantime, I heated a tablespoon of olive oil in a skillet and began to cook the onions, keeping them going until they were nice and brown. 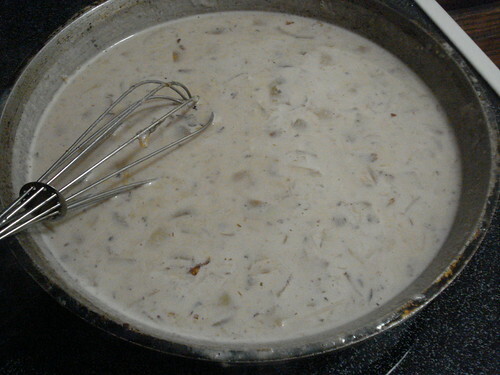 Then I added some flour and garlic powder (the recipe actually called for garlic, but I didn’t have any, which may be unprecedented in my household), then added milk and a bit of white wine and let the sauce cook and thicken. 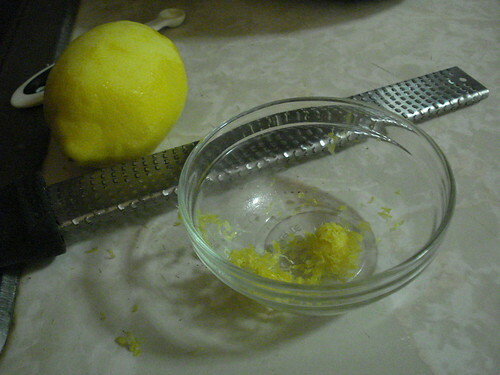 I stirred in some of the parmesan, some salt and pepper, and the lemon zest. 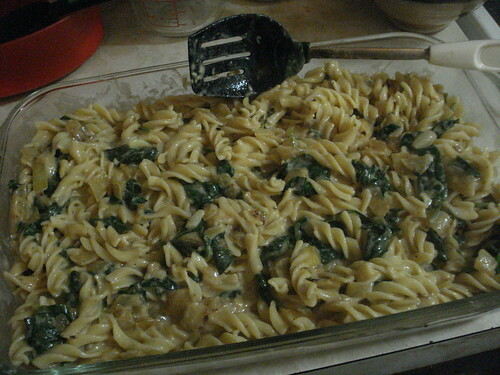 Then I poured the pasta and spinach into a baking pan, poured on the sauce, and mixed it all up. 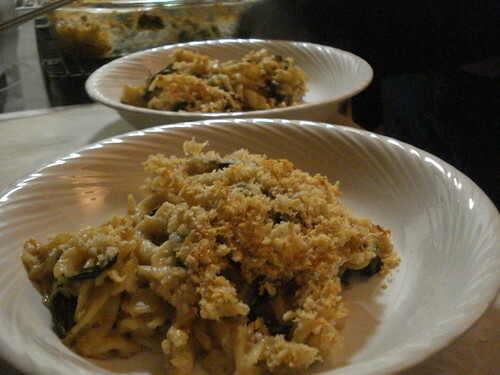 The crumb topping gave a nice, crispy texture to contrast with the creaminess of the sauce and noodles. 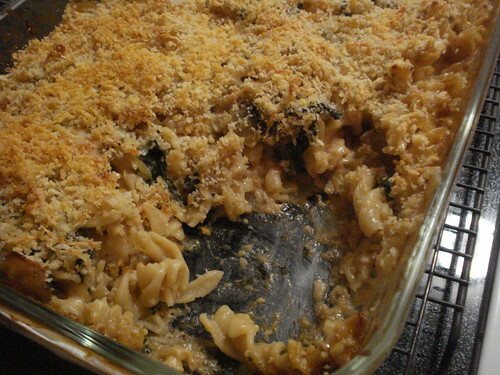 I have to admit, I’ve never bothered with a crumb topping for baked macaroni and cheese, but I see the light now. It’s part of that play of contrast and texture that helps elevate a dish from good to great. This dish was terrific; the tang of the parmesan and lemon balanced nicely with the smoothness of the milk and the savory richness of the long-cooked onions. 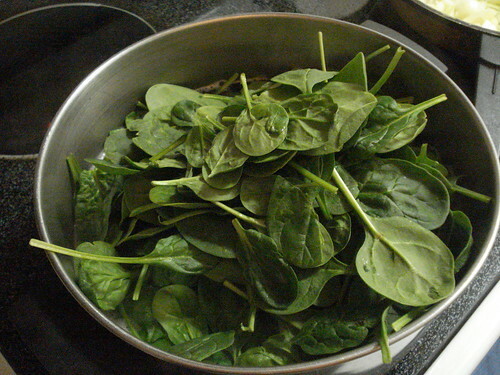 The spinach made it feel virtuous and added a nice resistant texture as well. Verdict: Success. I’d make this one again. You’ll have noticed that I haven’t posted in a while. You know how it feels when you’re busy all the time but if you stop and look back it’s hard to point to anything specific that quite accounts for all the time that passed? Yes, I did the AIDS Walk last Sunday, but that’s only one day. OK, we went to a movie the day before that and had dinner out. I worked quite a bit, but not exceptionally late. No single thing that explains such neglect. 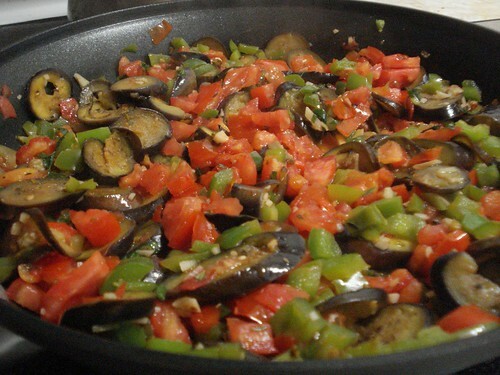 Cooking for yourself, even from scratch, doesn’t have to be time-consuming. 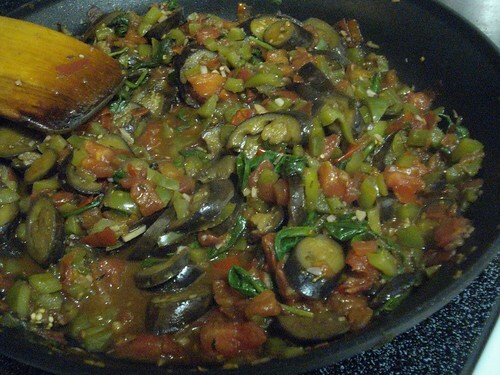 Most of the recipes I’ve chosen (especially recent ones) are not in and of themselves time-consuming. Where this blog project takes time is in going through the cookbooks and choosing what to try. That’s what I have balked at doing when work runs late and the weekend starts to fill up. For last night I knew I had to make time for a blog project, because we’re about to take a trip and I won’t be able to cook during it. 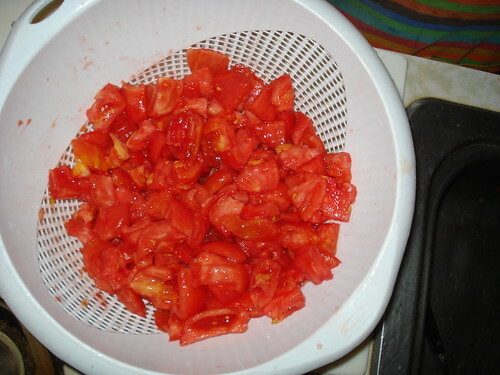 (I suppose that theoretically I could find something that requires no cooking or chopping, or mixing in bowls I won’t have available, and that won’t produce leftovers we can’t store…it doesn’t seem that likely now that I examine it in detail.) I promise to get back in the swing of things when we return. Heck, I’ll have to. It’s been warm the past few days, so I chose a couple of light and easy dishes from the Vegetarian Times Complete Cookbook. I’ve used this book before. My chief memory is that dishes that claim to be hot or spicy aren’t really; this is true of the magazine as well. But the dishes generally taste good. I made my way through the salad chapter and lit on a pasta salad with carrots and asparagus, and then added a chickpea saute for good measure. 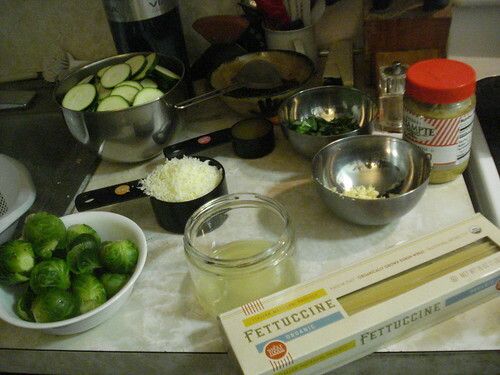 I began with the prep for both dishes. 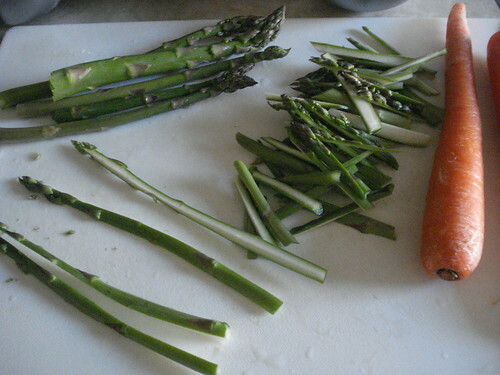 The trickiest thing is to quarter the asparagus spears lengthwise. 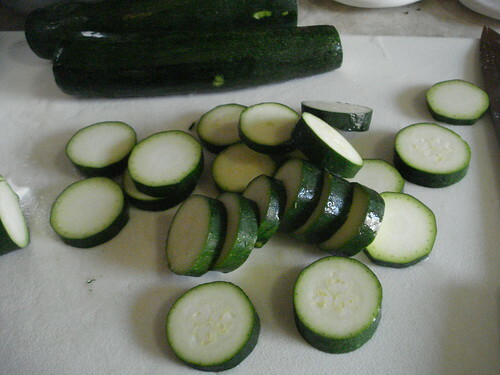 The recipe says to do that before cutting them into shorter pieces (about an inch and a half), but I found it easier to cut the shorter pieces and quarter those lengthwise. 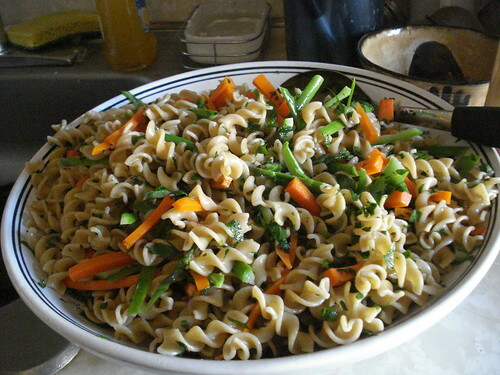 I cut up a couple of carrots to similar proportions, and minced some parsley, and that was it for prep for the pasta salad. For the chickpeas I minced some garlic and red onion. The pasta salad is a breeze. 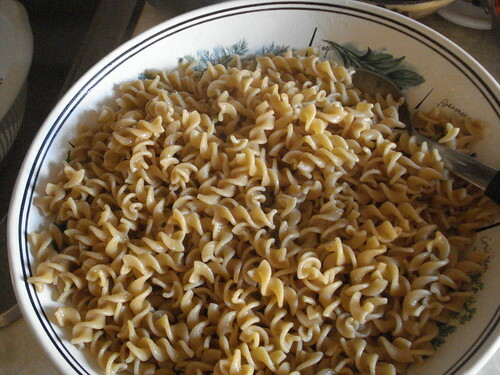 I cooked some whole-wheat spirals according to the package directions, drained the pasta, tossed it with some olive oil to help prevent the noodles from sticking together, and let them cool. 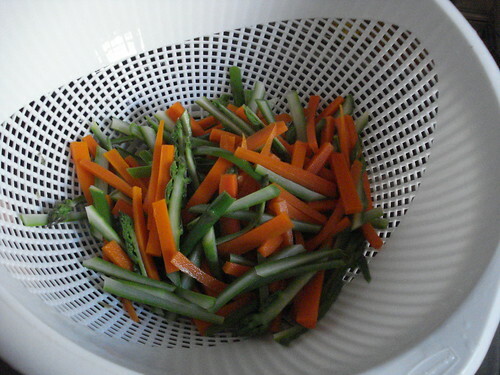 In the meantime I blanched the carrot and asparagus slivers. When the pasta was cool I mixed the vegetables and parsley in (yes, I know parsley is a vegetable, I’m just trying to be specific). I could have added capers as well, but didn’t have any. They’re optional. 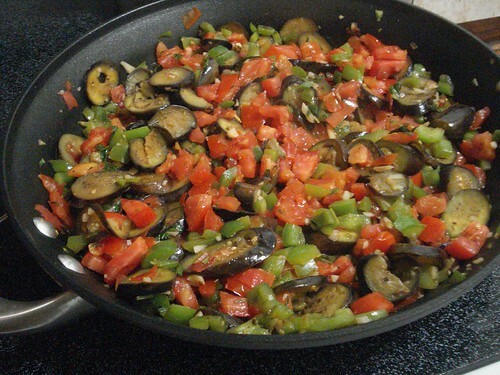 I then whisked together a dressing of balsamic vinegar, extra virgin olive oil, Dijon mustard, salt and pepper, and poured it over the salad, mixing well so it would be evenly distributed. 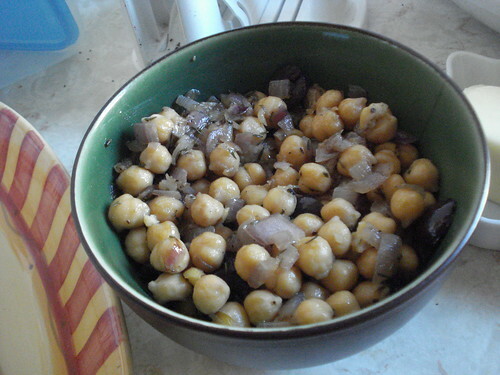 The chickpea dish is easy too. 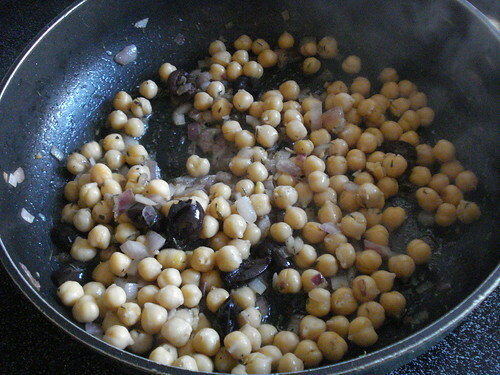 I sauteed the red onion and garlic in olive oil for a couple of minutes, then added a can of chickpeas (rinsed and drained) and some dried thyme, and cooked for a few more minutes. 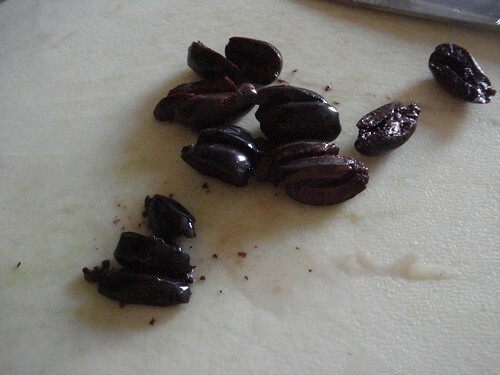 Then I added salt, pepper, and a bit of water, plus some kalamata olives (pitted and halved), and cooked that all together for a few minutes more. The recipes say both dishes are best at room temperature. This was convenient, because it meant I could cook ahead and then get the kitchen cleaned up and get some other things done before dinner. It also meant that when our dinner guests were running late, we could assure them it didn’t make a difference. 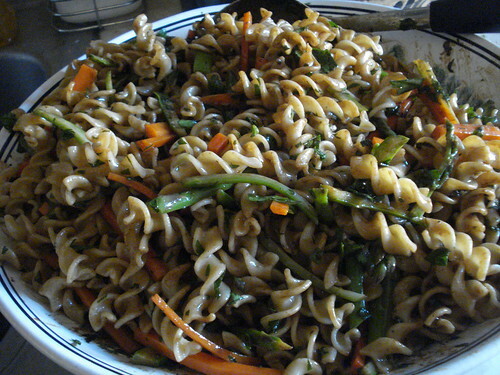 The pasta salad was really tasty, and the vegetables were still crisp enough to have a good bite to them. 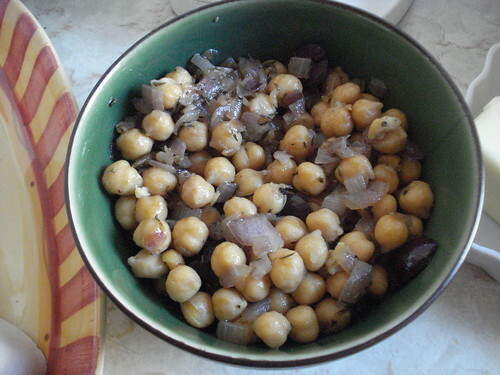 The chickpea dish was also good, with a rich, savory flavor. Verdict: Success. And that will have to hold until we’re back from our travels next week. 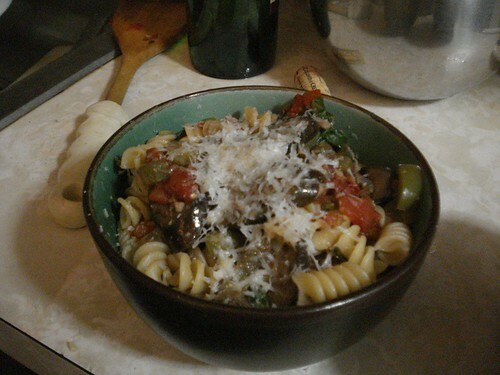 This is the pasta dish that I meant to make yesterday but saved for this evening. A good choice, as it turned out, since it was even hotter today and very stuffy. Last night’s hour-by-hour weather report forecast storms coming in by 4 pm, which would reduce the heat only a little but improve the air quality considerably. As of 9 pm there is no rain, but the pressure is enough to make one’s head explode. The cats are sprawled in the hallway, sniffing at faint breezes. The kitchen is cooling down from the baking I did earlier (I never said I was a smart planner). 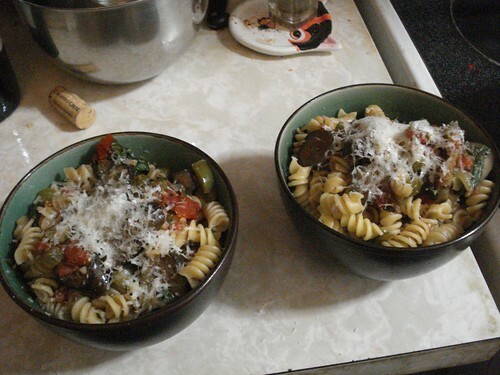 So a light and easy pasta dish was just the ticket for tonight. 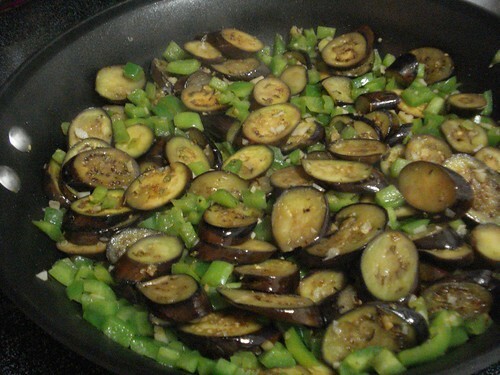 I’ve used Moosewood Restaurant Low-Fat Favorites often in the past. I had to dig a bit to find something I hadn’t already tried. Chili burgers? Been there. 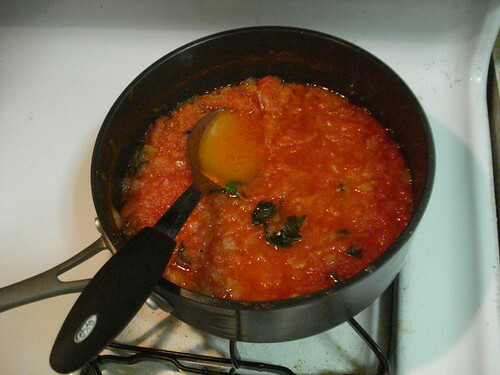 (Mash beans with grated carrot, oats, ketchup, and a few other odds and ends, and pan-fry — surprisingly good.) Seitan fajitas? I haven’t actually made that one but Scott has. Quinoa black bean salad? Already tried it, but thanks for the reminder — that will be good this summer. I turned more carefully to the pasta section and realized that I’ve flipped past zucchini saffron pasta before because it calls for saffron. Ah, saffron, luxurious and expensive spice. The stigma of a crocus, saffron is known for its rarity and its intense color. 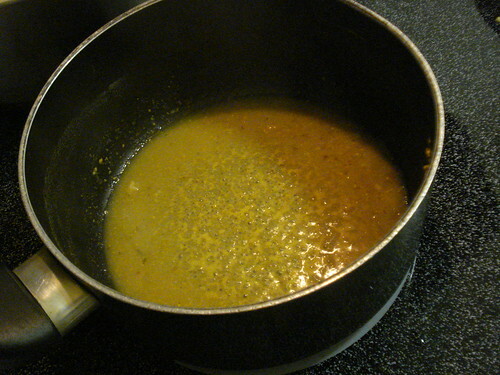 I’ve often substituted turmeric, which doesn’t quite match the flavor or color but costs considerably less. 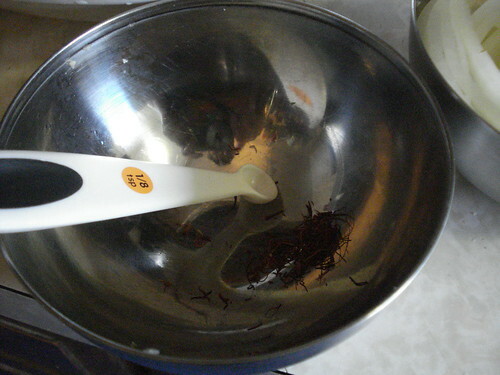 But as it happens, I have some saffron on hand, since I bought a jar for the Indian food I made in December, when I knew substitutions would not be right. A little saffron goes a long way, and while a jar with what looks like a modest number of thin red filaments seems expensive, you’re going to be able to do a lot with it. The per-use price may not be much worse than that of vanilla. 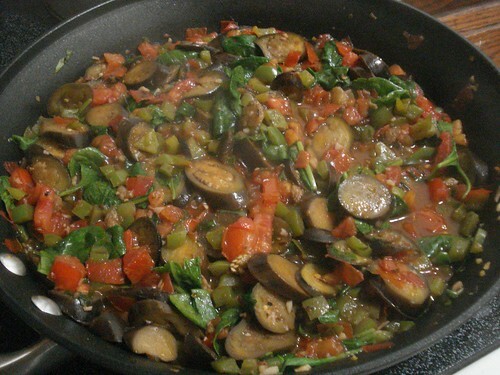 This dish is fairly simple. 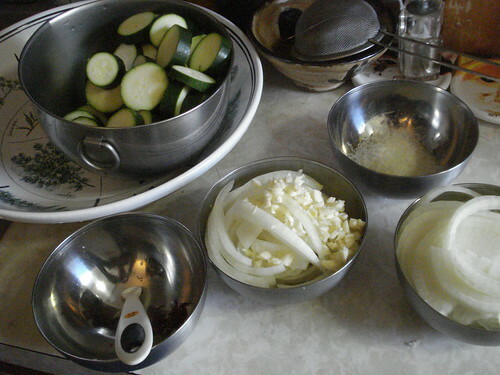 I did my vegetable prep first, juicing a couple of lemons, slicing some zucchini into rounds, mincing some garlic, and slicing a large onion. Then I put a pot of water to boil for the penne pasta. 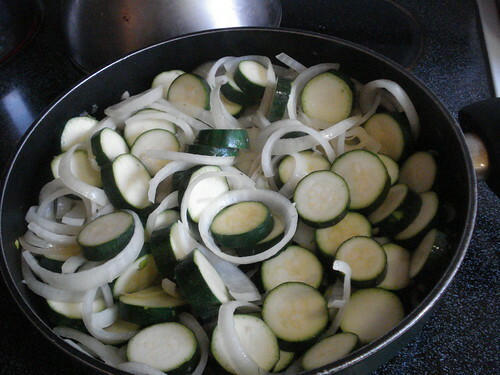 While that heated, I sauteed the garlic and onions in olive oil, then added the zucchini. 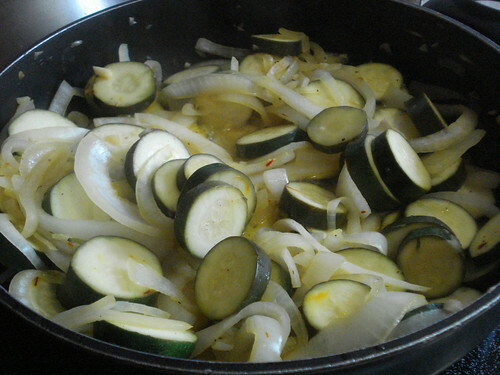 When the onions were translucent and the zucchini had started to brown a little, I crushed some saffron threads — or tried to, anyway — and mixed them with some water, then poured that into the pan. I rinsed the saffron bowl with the lemon juice and poured that into the pan as well, added a bit of salt and pepper, then lowered the heat and covered the pan to continue cooking while the penne finished. 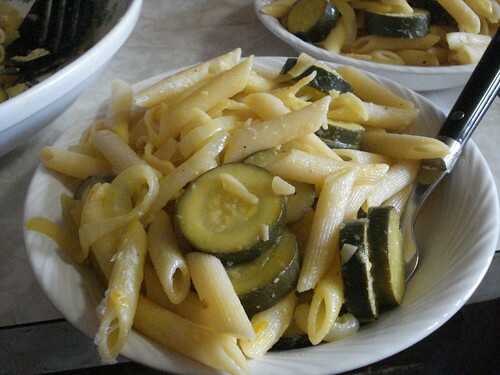 When the penne was cooked, I drained it and poured it into a large pasta bowl, then added the vegetable mixture and stirred it well so the chunks were evenly distributed and everything was a pleasant, warm, golden color from the saffron. 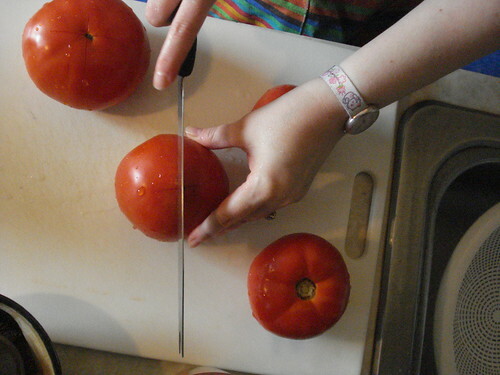 I grated on some romano cheese and served it up. 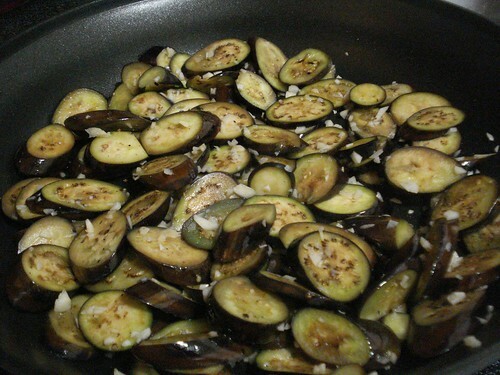 This dish is delightful. 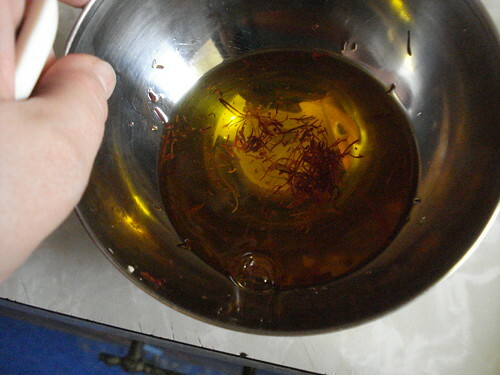 The saffron gives it a rich and unusual flavor, which is accentuated by the brightness of the lemon juice. It was ideal for a hot, sultry evening. Verdict: Success. This goes on the list for as long as I have saffron left — which ought to be a while. This is not the first time I’ve made more than one blog recipe at once, but I think it’s the first time I’m combining two books’ worth in a single post. I’m doing it because the recipe I chose from the Culinary Institute of America book isn’t quite enough to warrant its own post, though the book itself probably is. I could have made many more elaborate things from this book, and intend to do so in the future: corn chowder with chiles and Monterey Jack, spinach salad with marinated shiitakes and red onion, and chiles rellenos all beckon, but none of the more elaborate dishes fit with this weekend’s constraints, which were to make something not overly time-consuming and to buy as few additional groceries as possible. 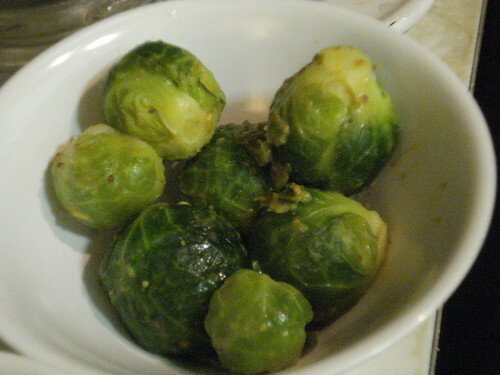 Brussels sprouts with mustard glaze, on the other hand, sounded tremendous, but not sufficient for dinner. So I flipped through Moosewood Restaurant Cooks at Home, which is a 1994 offering from the famed vegetarian restaurant in Ithaca, New York (I’ve never been, but I do have a Moosewood apron courtesy of a former boss). I wasn’t finding much to fit the bill there either, and was beginning to seriously consider the possibility that I was just being picky and distracted. My usual approach to such picky distraction is to make something I know by heart (chili-rubbed chicken, anyone?) or to propose a trip to the diner, but I thought I had better try to master my lazy impulses — and avoid falling even further behind on the blog — and make something anyway. 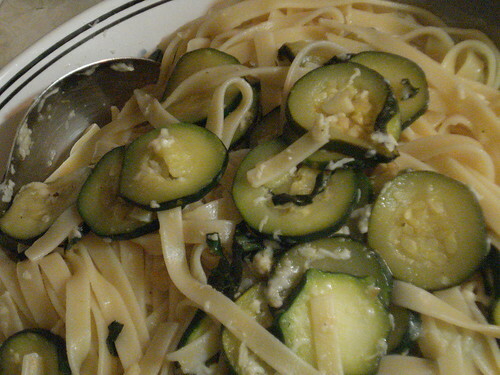 Spaghetti with zucchini and lemon seemed appealing, if not perfectly seasonable, and I knew it would be easy to get what I needed. I even had a box of long pasta just waiting for use, so it seemed perfect. 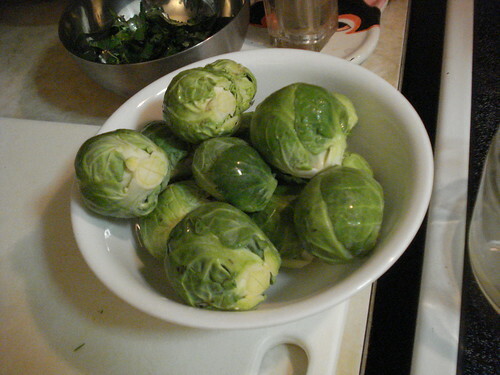 The Brussels sprouts would make a great side dish for a traditional dinner, and they’re really easy. I rinsed the sprouts, trimmed the hard ends, pulled away any loose or yellow leaves, and cut an X in the stem end of each. 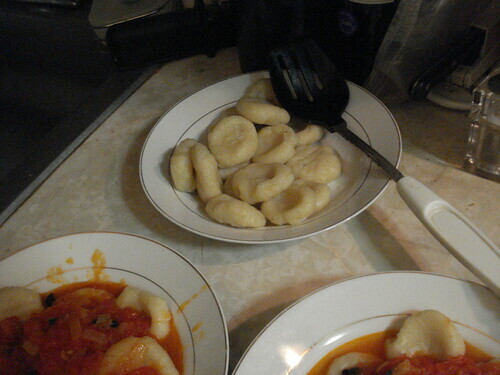 Then I cooked them in boiling salted water for about 10 minutes, after which I drained them. 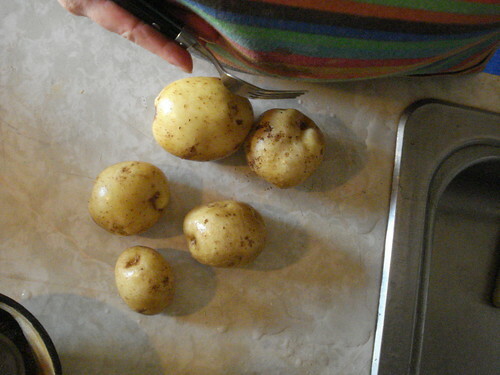 I was a little afraid they’d get too soft, but they were just right — tender and bright green. 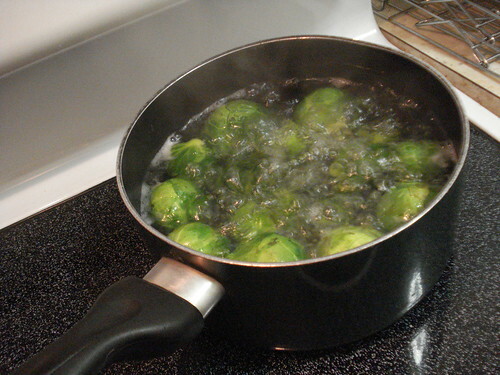 Then I heated some vegetable broth and some grainy mustard (the grainiest I found was still rather less grainy than what was pictured in the cookbook), and simmered the mixture briefly to thicken it, then tossed the sprouts in the glaze and served them. The pasta was a little more involved, though not by much. 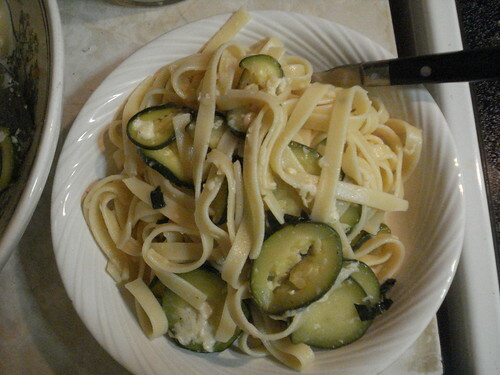 I sliced some zucchini into rounds, minced some garlic, cut some basil leaves into thin strips, juiced a lemon, and grated a fair bit of Romano cheese. Then I brought the water to boil for pasta. The recipe calls for spaghetti or linguini, but the long pasta I had on hand was fettucini, and I decided it was close enough for my purposes. 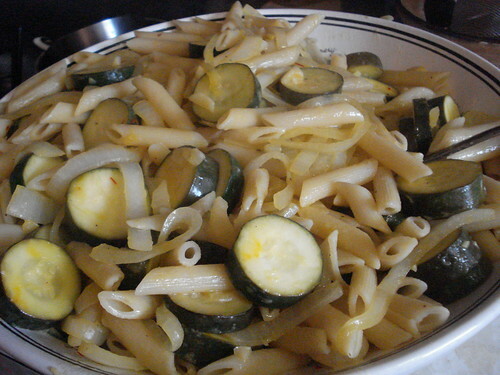 Once the pasta was in the water I heated some olive oil in a skillet and sauteed the zucchini and garlic. 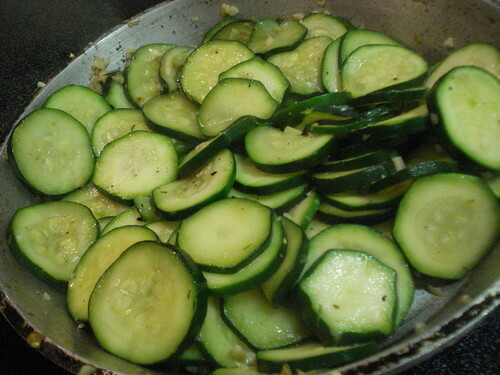 As you can tell from the picture, I had a bit more zucchini and less skillet than would have been ideal, but with some judicious turning I was able to cook the slices pretty evenly without managing to knock an unreasonable number out of the pan. 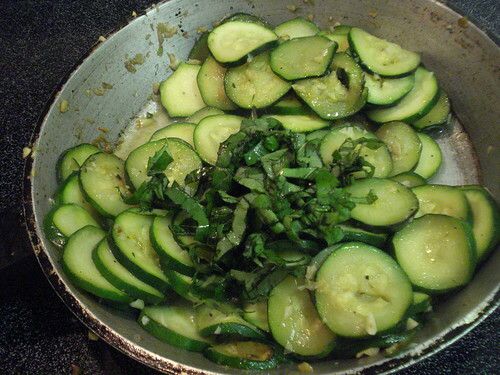 When the zucchini was a bit browned, I added some salt and pepper, then the lemon juice and basil. At this point I pulled the pan off the heat, and the fettucini was just about done too, so I drained the pasta and mixed everything together in a pasta bowl, adding the cheese at this point as well. 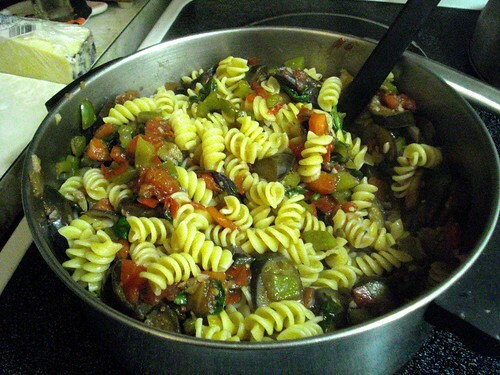 One drawback of the long flat noodles is that it is tricky to evenly mix a chunky vegetable mixture with them; perhaps the spaghetti or linguini would have been more suited, though not by much. When I had it as well combined as I thought I could manage, and the cheese had begun to melt and distribute itself pretty evenly, I dished it up. The Brussels sprouts were tasty. I like their bitterness, and I was a little afraid the mustard sauce would make them overwhelming, but it gave them a different kind of savory balance and worked quite well. 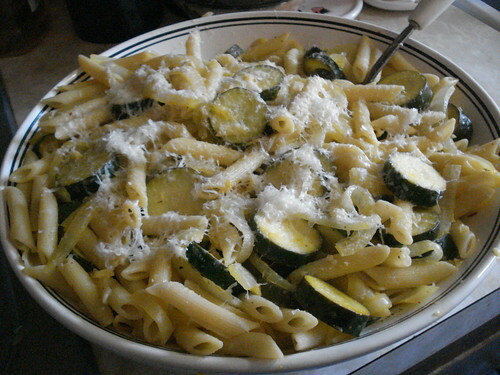 The pasta was delicious as well, with the lemon juice giving the zucchini a brighter, fresher flavor. The dish is probably better suited to late summer, but it was quite welcome on a snowy Saturday night. 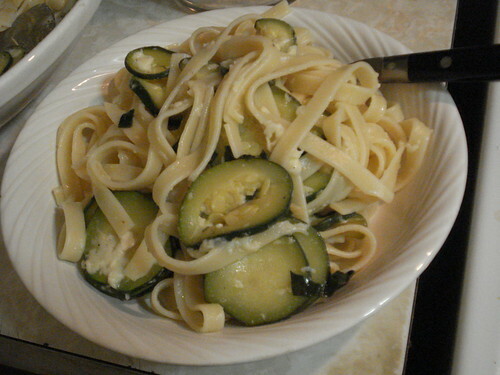 The two dishes were good complements, with the bitter edge of the pasta balancing the mellower zucchini and rich cheese. Verdict: Success. 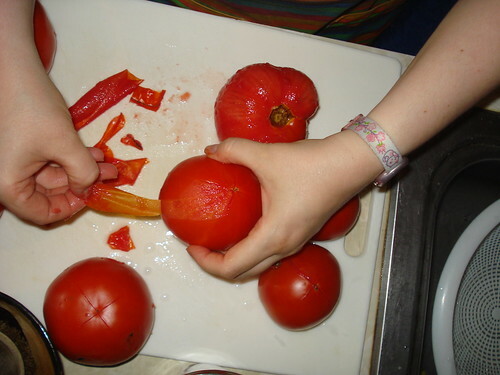 I’ll definitely make both again, and I will make a special effort to pick up the CIA Vegetables book again when the Greenmarket is in full swing. The premise of Joie Warner‚Äôs No-Cook Pasta Sauces is that you can make a tasty pasta meal with minimal time and cooking; most of the recipes require you to chop together fresh ingredients in a pasta bowl or other broad serving dish while the water is boiling to cook the noodles. I love this book, and I‚Äôve been in the habit of thinking that I know it very well, but in fact I have about four go-to recipes that I can prepare from memory. 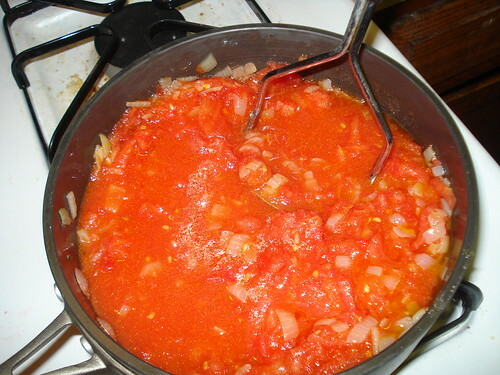 No-Cook Pasta Sauces contains 75 recipes. I have, as the educational set might say, not been working to potential. We had invited friends to dinner, one of whom is a vegetarian, so of the July collection this book seemed the most promising. Because the only thing that gets significant heat in this book is the pasta water, the ability to use meat is limited. Some recipes do call for it in the form of rotisserie chicken, cured or pre-cooked sausage, or shrimp that can be tossed into the noodle pot during the last few minutes of cooking. 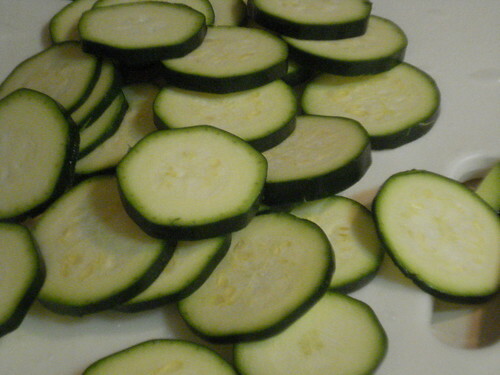 But mostly we‚Äôre dealing with fresh raw foods here, which is ideal for a summer evening. The recipe for broccoli and blue cheese sauce caught my eye because my initial reaction was to be intimidated: would it be too strong, too overwhelming? I decided that it would be better to ask Marianne and Colleen if they liked blue cheese than to chicken out, and fortunately they are both big fans, so I set out to get the ingredients. Garlic, crushed red pepper, olive oil, butter, blue cheese (I chose a Danish blue, whose chief point of differentiation was that it cost less than $10 a pound), parmesan, and broccoli. Even if I had gone for one of the more pricey cheeses (did you know some of the artisan varieties can run $30+ a pound?) it would not have been a very expensive meal. Preparation is easy. You crumble the blue cheese into a pasta bowl, mince the garlic, grate the parmesan, cut the butter into small chunks, and add the oil and red pepper, along with a couple of twists of freshly ground black pepper. Set the bowl over the pot in which you are bringing the pasta water to boil; this will soften the cheese and butter so you can mix the sauce well. Or, if you are inattentive, will melt them entirely, which is OK too. When the water is boiling remove the bowl (if you haven‚Äôt already) and pour in the dry pasta, plus some salt if that‚Äôs how you like it; while it cooks, cut the broccoli into florets. When the pasta is about 2 minutes from being done, add the broccoli to the water so it can cook; then drain and add the pasta and broccoli to the sauce, and stir well to coat. 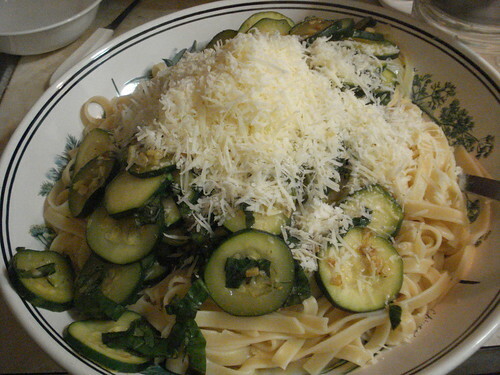 I brought out the parmesan hunk and the microplaner so we could add a little extra to our bowls. This dish was very well-received. And for good reason: It smelled and tasted fabulous. This is the kind of recipe I love for entertaining: It looks, as my husband puts it, gourmet-y, but it‚Äôs incredibly easy to make. We had the cold leftovers for dinner the next night,¬† along with leftover bread and some wine, and it was delicious that way as well. Verdict: Success. 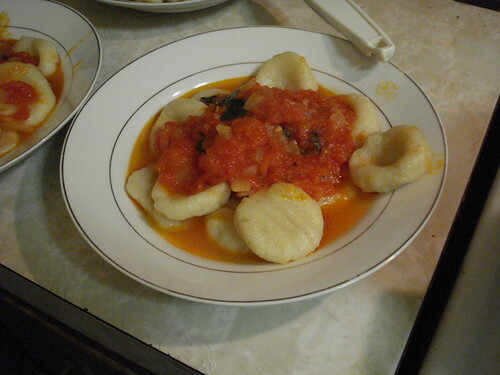 I will definitely make this recipe again, and I will be sure to mine this book for more dishes to try. Promising candidates include cherry tomato sauce with mint, sesame sauce with roasted red peppers, lemon and mascarpone sauce, and asparagus with orange and basil sauce.